Merry Christmas from Fountain Pen Restoration! This is our 7th Christmas post. In the past, I have shared Christmas themed pens and advertisements. 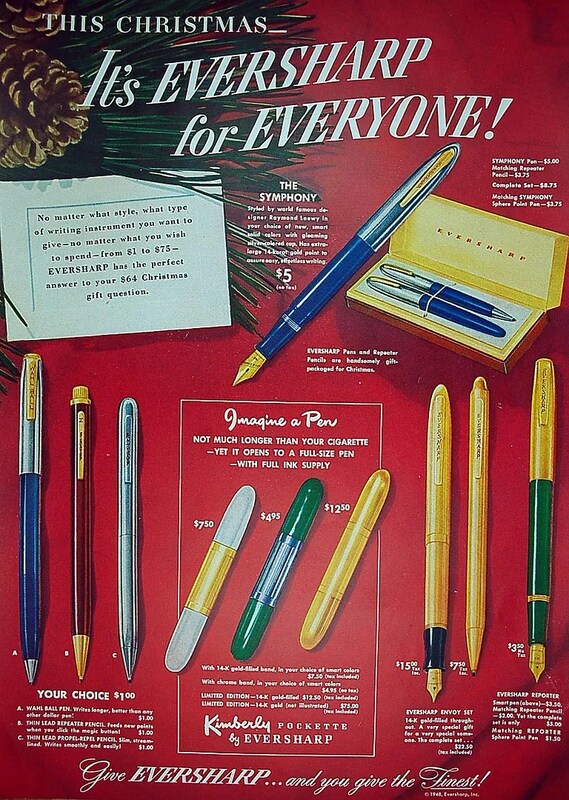 This year I will share another Christmas Advertisement – this one from Eversharp in 1948 and a recent addition to my collection. As my posts this year reflect, I became interested in Kimberly ballpoints, both pre and after Eversharp. So, in searching for advertising material, this came my way. Interestingly, it also promotes the Symphony, Envoy, and Reporter Fountain Pens – some of the last lines that they would produce in fountain pens. 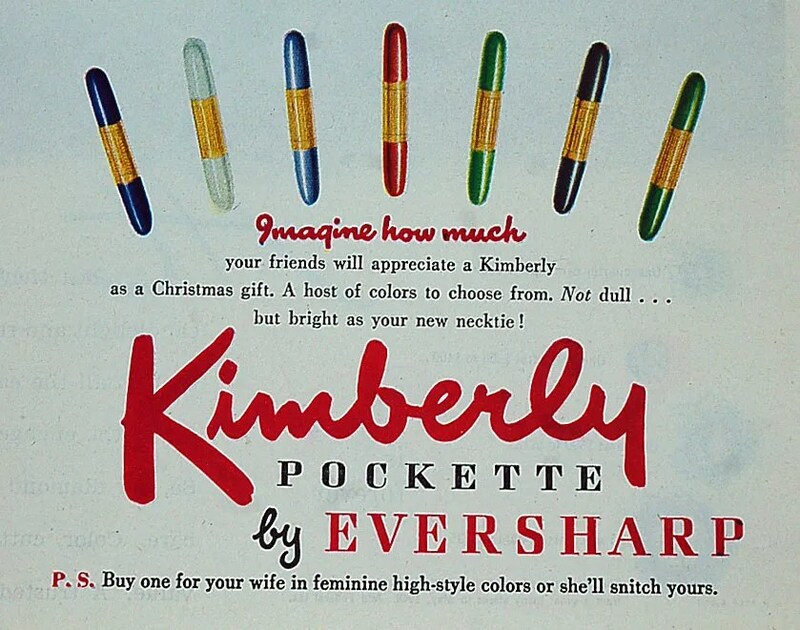 So, in 1948, you could spend anywhere from $1.00 (Wahl Ball Pen or Pencil) to $75.00 (an all gold Kimberly Pockette – has any one ever seen on of these? -not the gold filled) for an Eversharp writing instrument. Happy Reading and look for more restoration in 2014! Following up on my last post on Kimberly Ballpoints, here is the promised third and final installment . 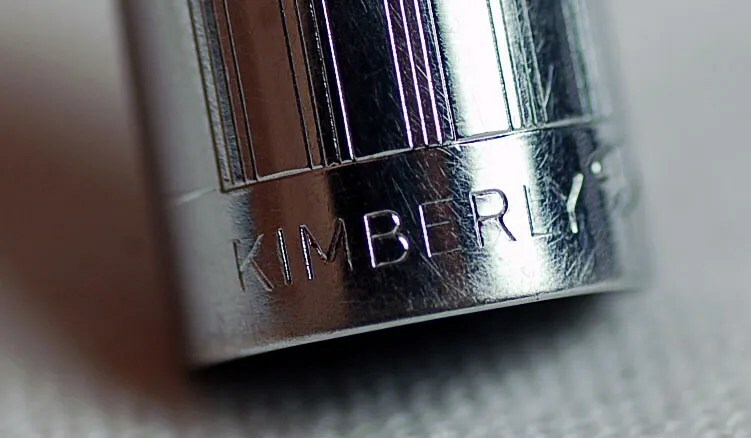 The pens below are a bit different to the other previously cleaned and restored in that they cover three groups of the original Kimberly’s that I have not previously shown ~ Ladies, Gold, and Boxed. 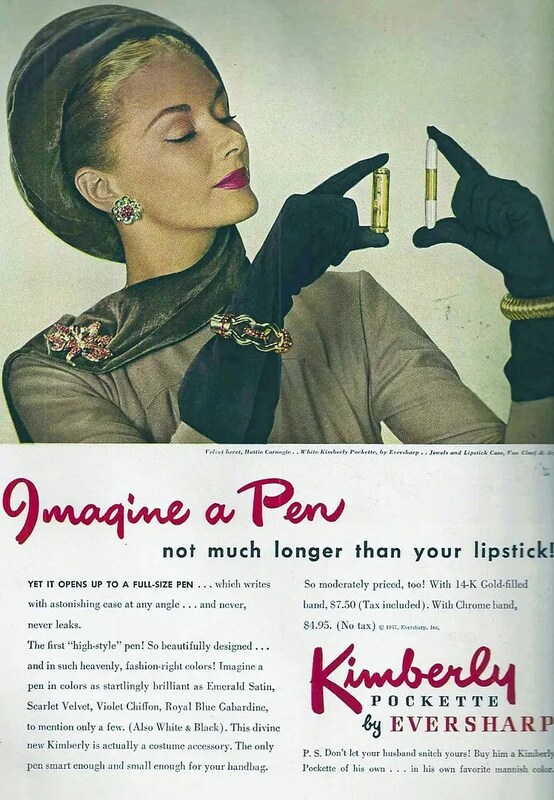 The following advertisement, featuring New York fashion designer Hattie Carnegie, is from 1947, and focuses on the ladies version of these pens. 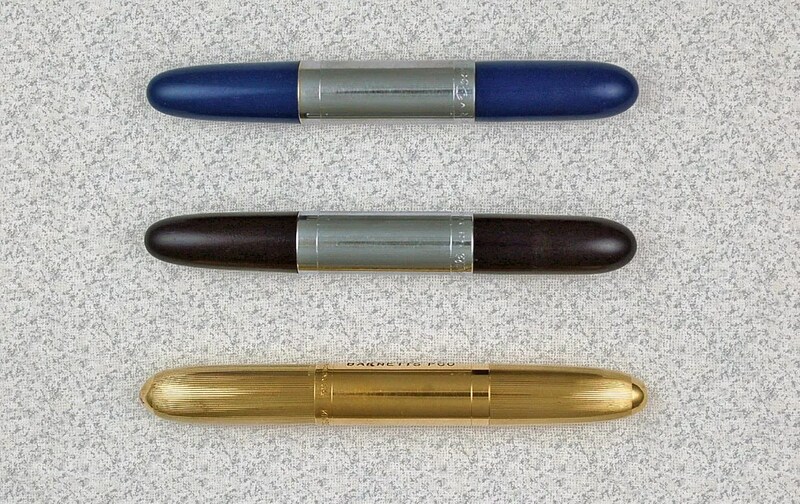 Below are the three pens – a ladies blue, standard black (both with silver bands – 4.95 model), and a 14K gold filled version. Cleaning involves removing the messy refills which have often clogged up the barrel and cap. Cleaning the insides and polishing the outsides. Be careful to not get too aggressive with the 14K wash, as it will begin to rub off with too much polishing. I recommend maybe a short bath in an ultrasonic cleaner and a gentle rub down with a jewelers cloth. Finished products below, both closed and posted. I refill these (as previously mentioned) with carefully trimmed Cross Ballpoint refills. The blue is probably the brighter blue, marketed as Blue Gabardine in the advertisement above. 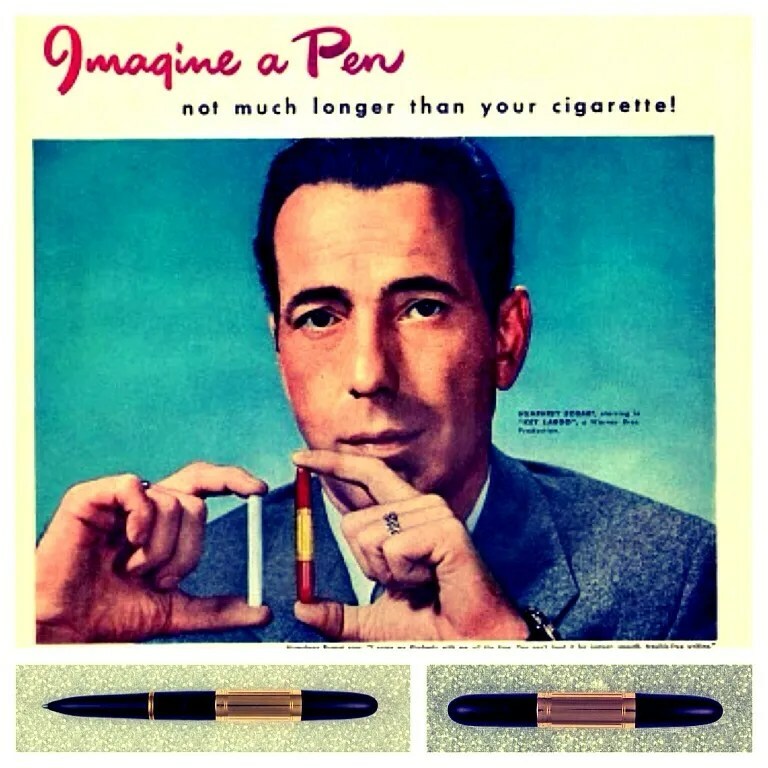 Marketed to women was through advertisements such as Ms. Carnegie’s, comparing it to a tube of lipstick, as opposed to the darker more traditional colors, marketed through ads with Humphrey Bogart and Fred McMurray, comparing the pens to cigarettes. Finally, I have one pen in my collection in its original box and price sticker. This one is the darker green version with the less expensive chrome band and the $4.95 price tag is still visible on the barrel. My favorite aspect of the box is the cover, which shows some of the brightest (and harder to find) colors available to the model. 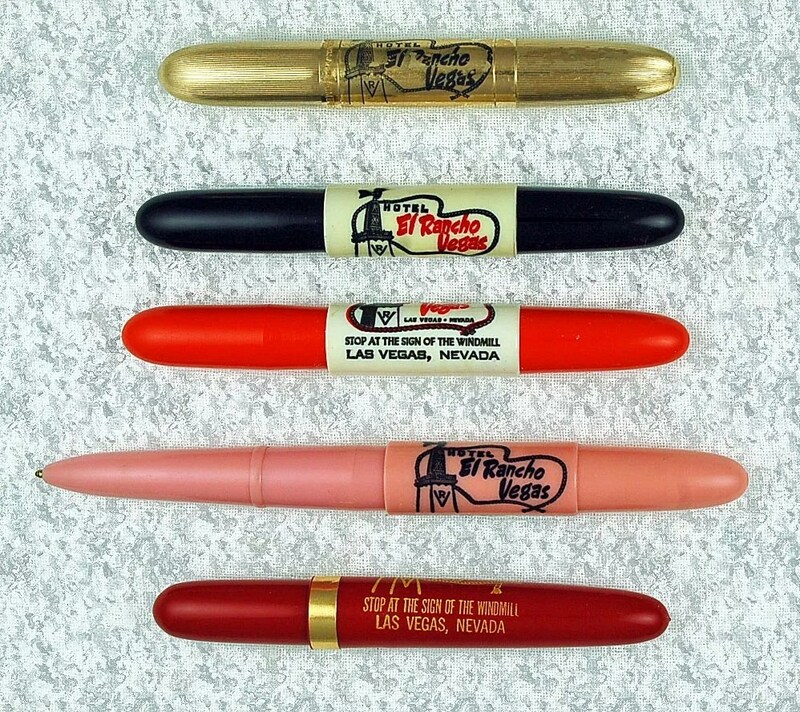 Finally, as an addendum, I recently picked up 5 advertising Pockettes, highlighted and promoting the El Rancho Vegas Hotel. Interestingly, this was the first Hotel/Casino built on the Las Vegas Strip (1941). It was destroyed by fire in 1960 and never rebuilt. Somehow, these survived. 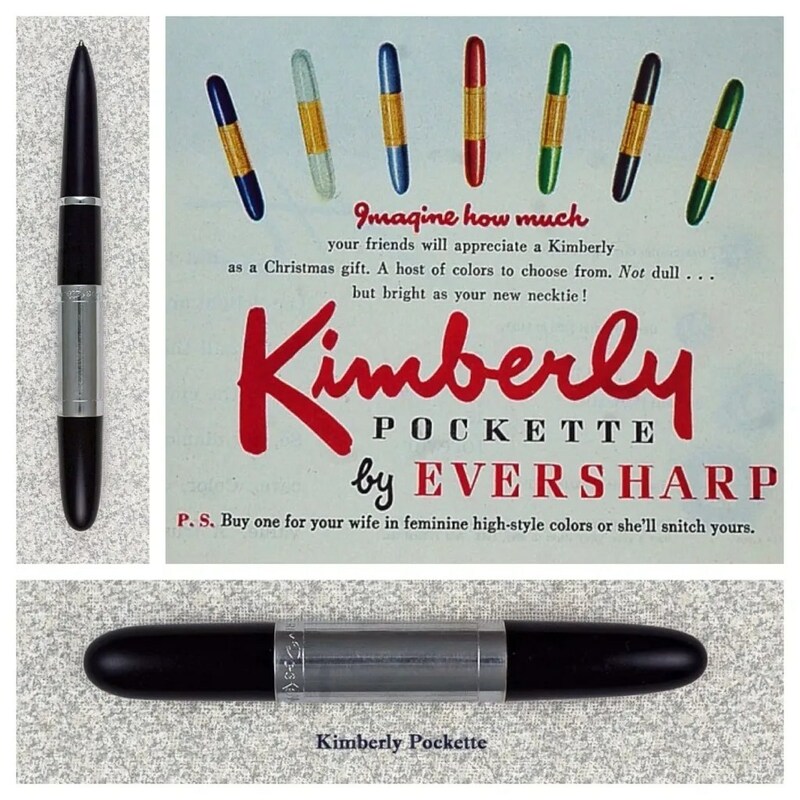 They are another example of how Eversharp used this line of pens – to businesses to promote their product, and to thank clients. Note that the bottom pen is a bit different in configuration than the others. It is actually a later model of the original, with a smaller cap ring. This is my third Eversharp Pockette post. Thank you for allowing me to deviate from the Fountain Pen theme occasionally. As we hunt for fountain pens, we can’t help but run into their less expensive cousins – cousins that contributed to the Fountain Pen’s demise. 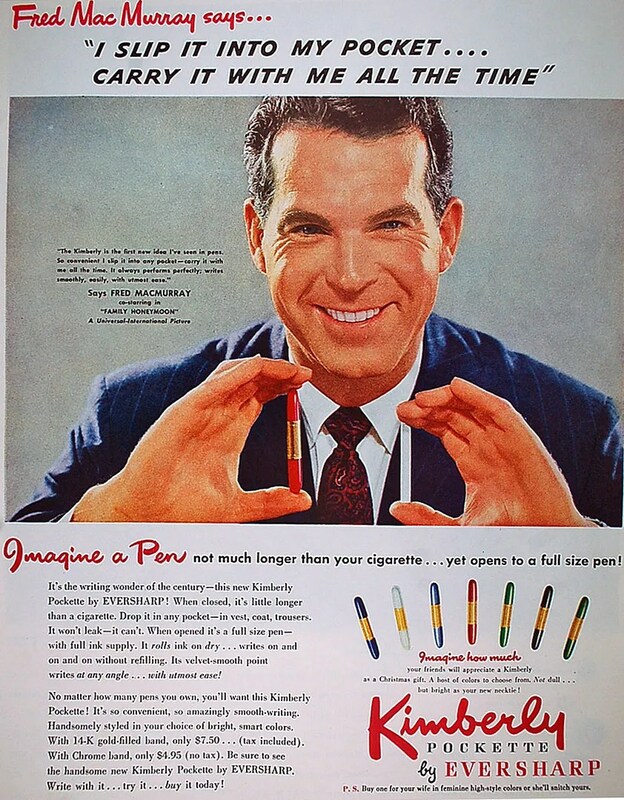 After the last post that I wrote about a blue Kimberly Pockette (dated March 4, 2013), I decided to hunt down a 1948 Humphrey Bogart ad for the same pens. This pen was a dubonnet red version, so then I decided to hunt one of those down to match the advertisement. As these are not terribly popular and there are no refills available (see solution below), this was easy to do. Below is a photograph of the Pockette after I took it apart. You can see that not only was I able to find the dubonnet colored with the gold filled band and clutch ring, but one with the chrome band/ring. 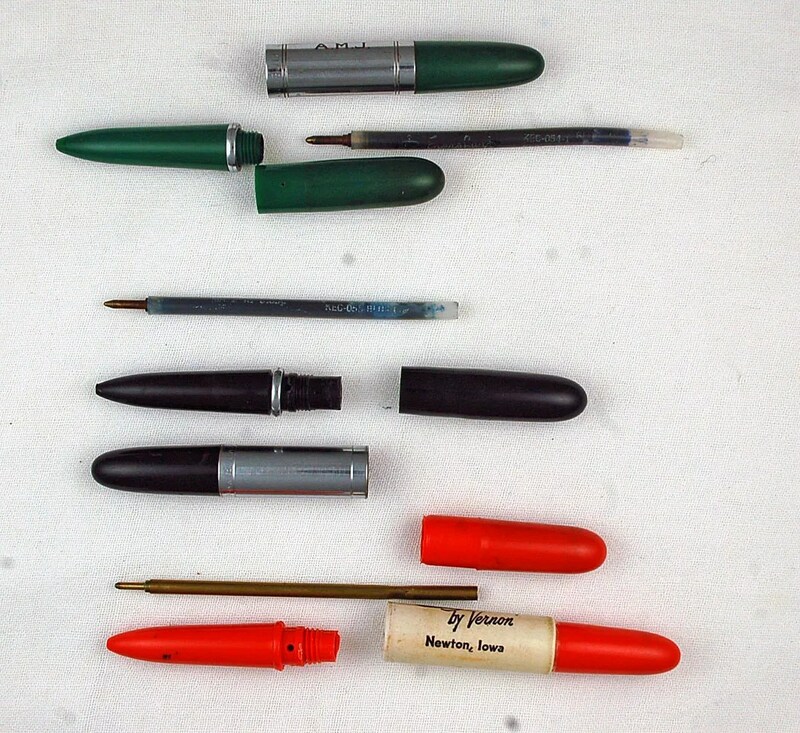 I have also shown the old refills that were used in these pens. They are no longer available in usable form. So, I have experimented and found that Cross refills (shown below with the blue caps) as well as Penatia branded work quite well, when trimmed to the same size. While looking for the above pens, I came upon black and light green pens, and an advertising version. Here they are shown, with their dried out refills. Not a lot of work goes in to cleaning these. I simply put each part through a bath in an ultrasonic cleaner to remove any dried ink inside the caps and barrels (the refill ends are prone to a bit of leaking). I then proceeded to polish all of the externals. The orange promotional pen, probably dated a bit later than these original Pockettes, has a cheaper plastic and required a bit more work to remove some stubborn stains. Once cleaned, I measured and cut the new Cross/Penatia refills and cut them to fit each barrel. 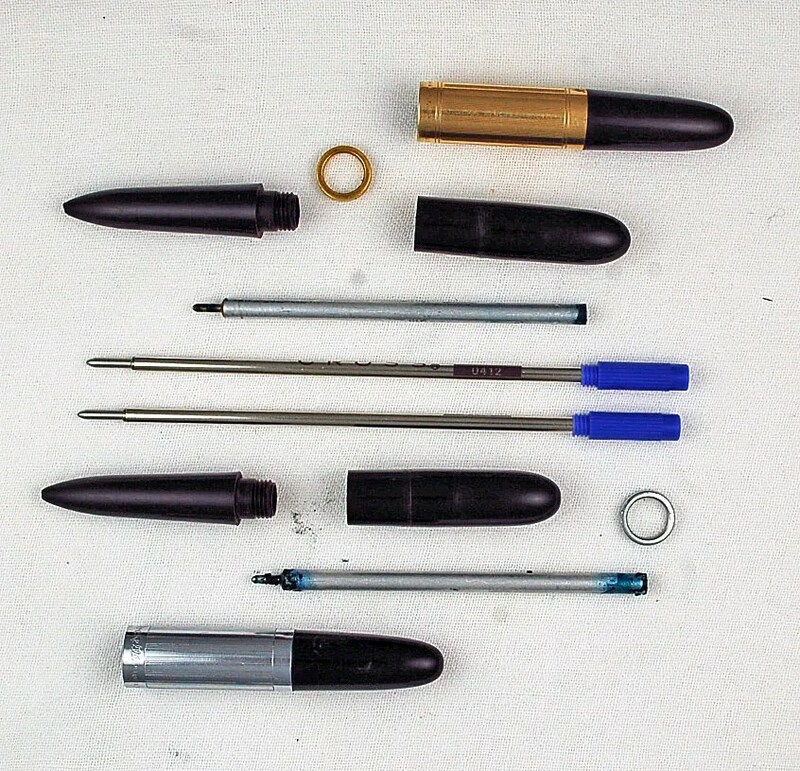 The resulting pens are below, measuring 3 3/8 inches closed and 4 3/4 inches posted. The photo below shows all of the lot completed. 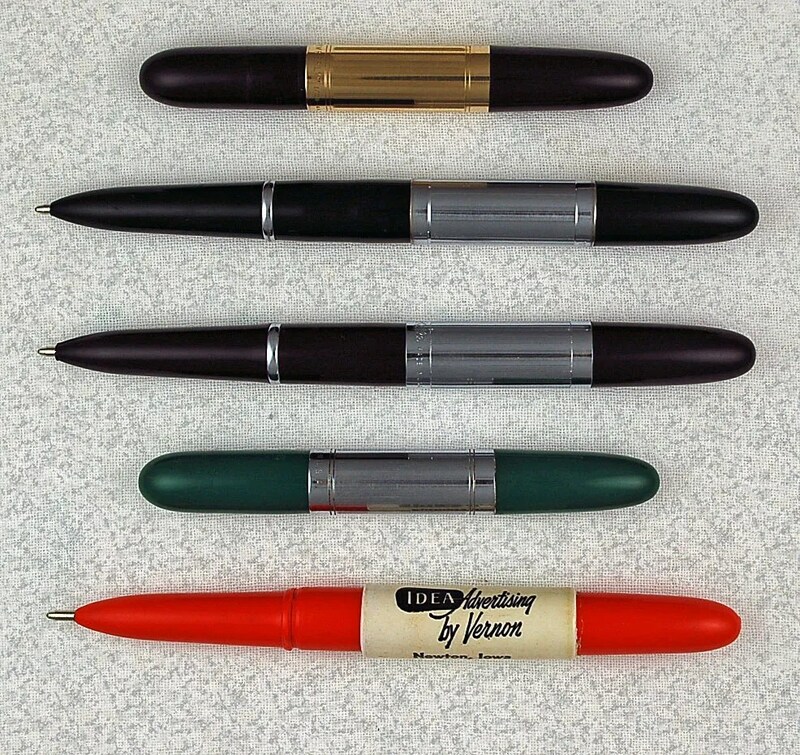 From top to bottom – Dubonnet red with gold band, Black with chrome band, Dubonnet Red with chrome band, Green with chrome band, and promotional (these came in a wide variety of colors). The green pen may in fact be a “female” green, as it is a bit lighter than reflected below. 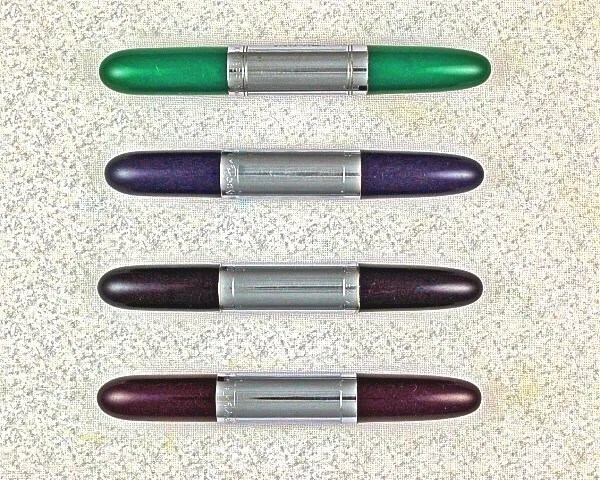 As mentioned in my previous post, and as outlined here, the Pockettes came in male and female colors. The promotional pen features wording ~ IDEA Advertising by Vernon, Newton, Iowa. Interestingly, Vernon Advertising is a large employer today, still located in Newton, Iowa – just east of Des Moines. Individual photos of the “Bogart Ballpoint”.. Finally, some fun with Pen Photos ~ Below I used Mac Collage (free), Instagram, and PicFrame to produce these fun images. After a while, I get tired of just the same old light tent photos. Makes the pens look more interesting…. When I first saw this at an antique store in a glass of pens and pencils, I thought it was a bullet pencil, but further examination revealed a ballpoint. I grabbed it for a dollar, and brought it home for further examination. 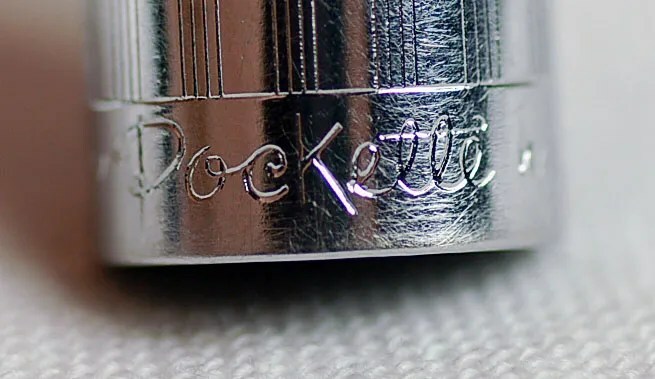 After reading the imprint on the silver band, and doing some research on the web, I learned a bit about this compact pen. Easy to take apart, below are the components. I washed the barrel, blind cap and cap in an ultrasonic cleaner. The old ballpoint refill had, of course dried out. But not before draining some of its blue ink into the blind cap and barrel. So, I had to spend a considerable amount of time trying to get the gooey mess out of each. Once cleaned, the real work begins…. First, I wanted to find if refills still exist – they do not. To do this required more web searches. 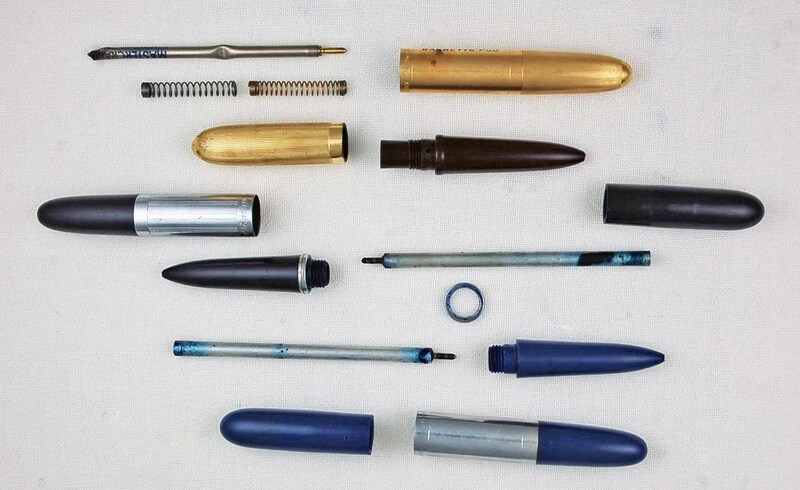 To learn more about these ballpoints requires a visit to an amazing site, maintained by Richard Binder – Richards Pens. I have no relationship to this site, but do visit it regularly. His Kimberly information, found here, is phenomenal. Any information I have acquired, comes directly from his site. 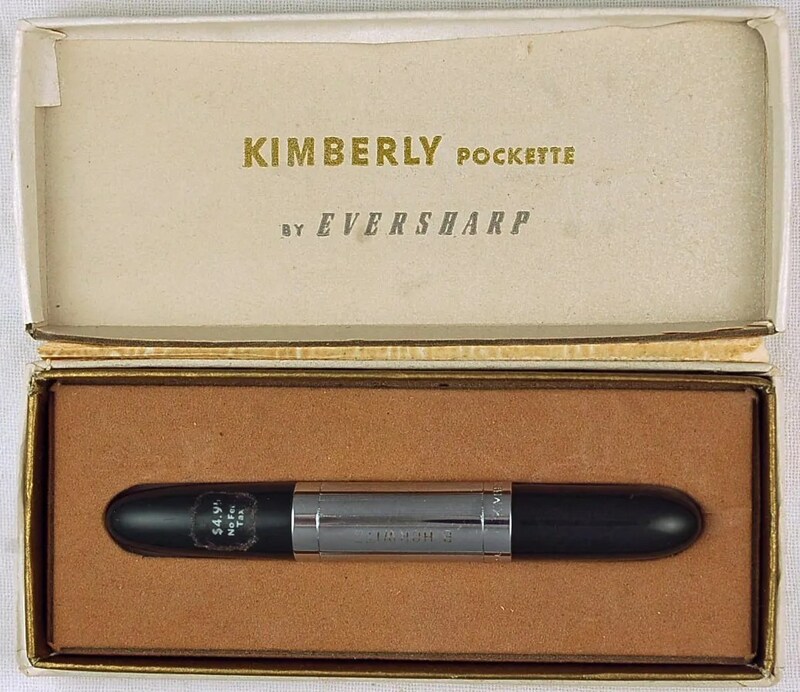 Basically, Kimberly Ballpoints were produced by Kimberly, which was purchase by Eversharp, which was eventually purchased by Parker. The model I have is a Pockette, the first model, produced sometime during or after the mid 1940s. 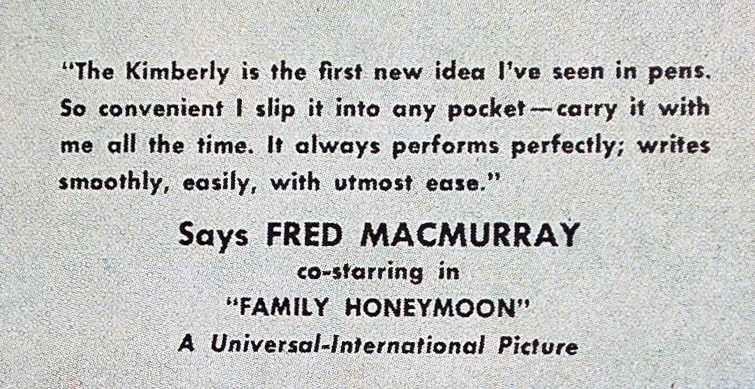 This advertisement (below), from my collection, is from an October 16,1948 issue of The Saturday Evening Post, featuring Fred MacMurray, showing the Pockette next to a cigarette for size comparison. 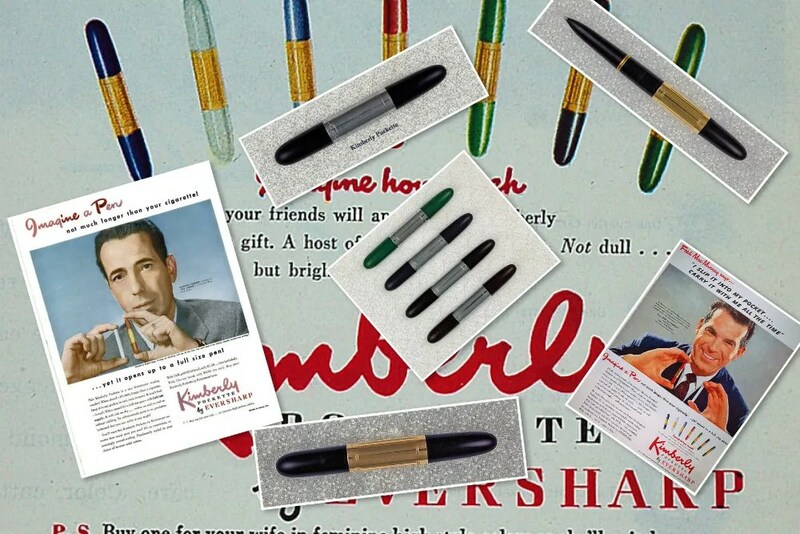 Referring to the link above (Richard’s Pens) will provide far more detailed information on the history of the Kimberly Ballpoints, including Models offered, and Colors. 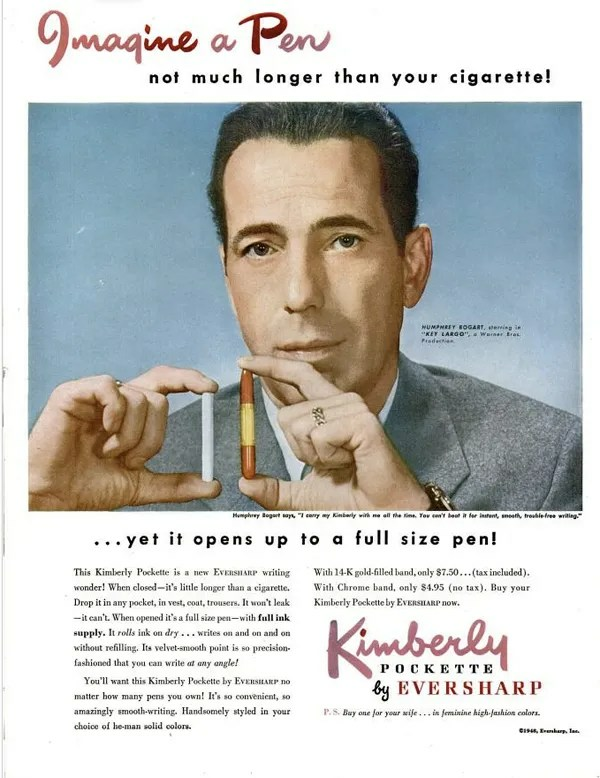 This is the only Kimberly advertisement that I have, but an internet search will reveal that Humphrey Bogart was also featured in one of these cigarette comparison ads. Nothing against Fred MacMurray (as a kid I loved him as the Dad in My Three Sons), but Bogart would be a cooler ad to own, and photograph…. Back to the refill. I read in various locations that Paper Mate and Cross refills could be adapted to work in Kimberly Pens. I tried a Papermate, but it was a little too large to fit through the barrel. These may work in the later Pockette Jr. and Reporter models, but did not in my Pockette. I then remembered that I had an old Cross Ballpoint – you know, the long slender ones that are often given as gifts. I pulled the refill out and the fit was not good, but better than any so far. I admit that I had to widen the tip opening just a small amount, simply using the refill itself. Now the fit was perfect. I cut the refill to match the length of the original Kimberly (pictured above), and reassembled the pen. It fit perfectly and was ready to write (albeit a ballpoint). Finally, I applied some scratch remover, then polish to the plastic to brighten it up a bit. The completed pen is below. The pen measures 3 3/8 inches closed and 4 3/4 inches posted. As you can see, this is not the gold filled band model ($7.50 in 1948), but the chrome banded model ($4.95 and not featured in the advertisement). It is dark blue, presumably not one of the feminine colors referred to above. 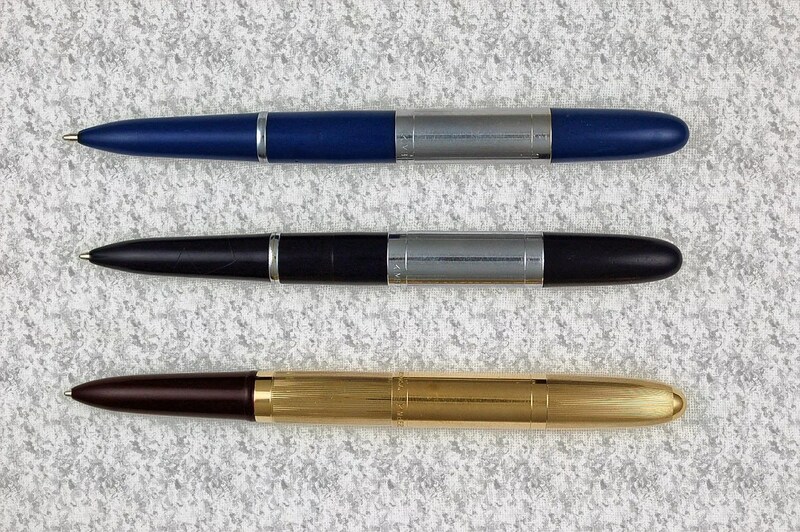 These are another example of long/short pens, appealing to the ease of carrying in a pocket or purse. Yes, they are not a Fountain Pen Restoration, but an interesting writing instrument restoration, from a once major fountain pen manufacturer.